In the first month of school, I was wondering how to introduce connecting learning in my classroom. Do I start with informing them of the concept, or do I let them explore at their own risk? Our students need activities that mean something to them. Whether they relate to their experiences, interests, or simply their peer culture. I enjoy implementing activities that I feel that my students are highly engaged in and actively participating in. I have noticed that teaching with inquiry captures the students attention and allows them to utilize their higher order thinking skills. I am a sixth grade science educator at a school in eastern North Carolina. I graduated from East Carolina University with a degree in middle grades education with concentrations in science and mathematics. The school contains a wide range of socioeconomic statuses within grades sixth, seventh, and eighth grade. The population break down of the school is 64% african american, 25% caucasian, 5% hispanic, 2% asian, and 3% biracial. The class sizes range from twenty-three to twenty-five with multiple intelligence levels incorporated. As a sixth grade teacher, students come to middle school from a wide range of elementary schools in the area. The students are unfamiliar with one another and are meeting new faces constantly. Therefore, they are hesitant to work with one another collaboratively. What do you think of when you hear connected learning? This question rises in education on a daily basis. I enter this inquiry by utilizing an activity to represent the production-centered connected learning strategy. Throughout the years of 2013 and 2014, I participated in East Carolina University’s Tar River Writing Project. The writing project allowed me to explore connected learning by completing a MOOC’s that centered on connected learning. This experience helped me to see learning through the eyes of a student instead of a teacher as I was making and producing with my colleagues as a way to learn. Throughout the program, I learned how important it is to implement connected learning into the classroom as a way to engage students. Thus, I decided to introduce connected learning through the spaghetti tower building activity where they are asked to design, produce, and create cooperatively. 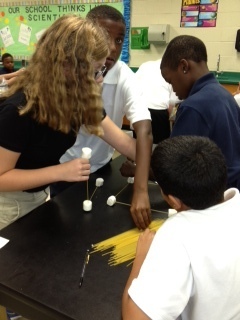 Students are driven to think creatively, to use their higher order thinking skills to design a tower out of spaghetti noodles and marshmallows, and to collaborate through the entire activity, building collaborative problem-solving abilities. This activity works at the intersections of Connected Learning and STEAM (Science, Technology, Engineering, Arts, and Math) as students are making, creating peer-to-peer networks, and working to understand basic principles of engineering and architectural aesthetics. How does the spaghetti tower activity work? As a precursor to the activity, students looked at photos of famous architectural structures, considering both form and function, and discussed the importance of certain methods of each structure. These “mentor texts” then guided the students in making their own architectural innovations with common materials– spaghetti noodles and marshmallows. Students worked in small groups, and they chose a group role– timekeeper, materials handler, or noise monitor. The timekeeper was informed to instruct the group when five and ten minutes of time was remaining. The materials handler was instructed to come up and get the materials, as well as put the materials away. The noise monitor role was to inform the students if their noise level was too excessive at any given time. By allowing the students to have different roles, it allows students to feel as if they served a particular function in the group that best matched their particular strength. Next, I informed the students that they would be building a tower and they must use only marshmallows and regular spaghetti noodles. I also informed students that they can break the noodles and separate the marshmallows in any method they choose. To help students with designing the spaghetti tower, I allowed them to map out the tower before hand with their partners for five minutes, practing their planning and prototyping skills. When the class was ready, students began creating the tower with their partners and were given twenty minutes to assemble their structures. As a follow-up activity, students were asked to use technology to share the products that they had made with the entire group. Students included their planning designs, a picture of their tower, a written summary of how they built the tower, and a section explaining how they would change their design if they were to complete the activity again. Students chose to use Prezis and Youtube videos to document their processes and products, and the digital texts they created represented the kinds of non-fiction technical writing that are common in STEM fields. In the pictures shown, sixth grade students are working cooperatively, engaged, and experience a real-life situation that they must work through together. The activity is a wonderful way to introduce many real life applications used in careers of engineering, architecture, and construction and demonstrates how writing functions in these STEM disciplines. It also uses the connected learning principles of maker-centered learning, productive peer interactions, and open networks to make learning relevant and engageing. Your students, too, can generate their own marshmallow spaghetti towers and write about their constructions along the way. How might you adapt this activity for your classroom?